Minutes Before Sunset (Timely Death Trilogy #1) | Live. Laugh. Read. First of all, I would like give a huge thank you to Shannon A. Thompson for providing me with a copy of her book. “Minutes Before Sunset” is an absolutely stunning novel that completely messed with my emotions. I laughed with the characters, cried with them, felt all warm and fuzzy inside, was heartbroken, proud and sympathised with the pain in their lives. I loved learning all about the shades, the Light and the Dark with Jessica. I also discovered the full prophecy alongside Eric and the betrayal he felt by everyone keeping it from him was palpable. All the characters were so humane, so relatable, even when they shouldn’t have been. There was also a lot of sass, sarcasm and witty banter mixed into all the relationships – particularly that of Jessica and Eric. The characters each had their own quirks, their own flaws, and that’s what made them so perfect. Most of all, we were with them as they learned to love in spite of everything. Miss. Thompson twisted the concept of Light and Dark, reversing the well-known roles, changing the time-old dance and making it her own. Brilliant and true, “Minutes Before Sunset” is thought-provoking, bringing real-life lessons and morals from a world of the supernatural. I loved how Jessica’s relationship with Eric during the day paralleled with Shoman’s relationship with the nameless shade at night. These relationships provided a refuge for the characters, a much-needed solace. There was a lightness in the air that made my heart soar, and when they fell in love it was beautiful and seamless, a tune to which my heart melted. Shannon’s depiction of love is like none that I have read before, sweet and without angst. Theirs is the love that you wish you could have. The ending… Without giving anything away, it was heart-wrenchingly sad yet full of hope. It was the perfect solution, but the one you wished didn’t have to happen. I also loved how the fireworks was brought full-circle, it was a very nice touch. “Minutes Before Sunset” is brilliantly written and left me aching for more. I highly recommend it to all, particularly those interested in young adult and a unique branch of the supernatural. 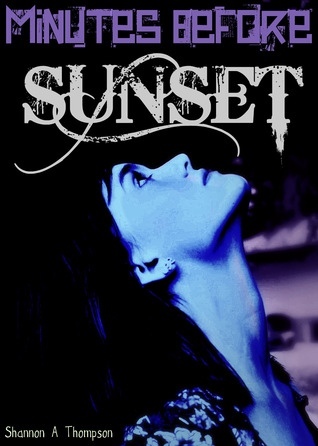 Thank you for reading and reviewing Minutes Before Sunset! Sharing now! Pingback: Friday Finds #1 | Live. Laugh. Read. Pingback: Cover Reveal: Minutes Before Sunset (The Timely Death Trilogy #1) by Shannon A. Thompson | Live. Laugh. Read. Pingback: Cover Reveal: Seconds Before Sunrise (The Timely Death Trilogy #1) by Shannon A. Thompson | Live. Laugh. Read.